This research project took place 2010-1012 and compared the approaches of different asylum advocacy organisations in Britain and America using questionnaires and interviews. 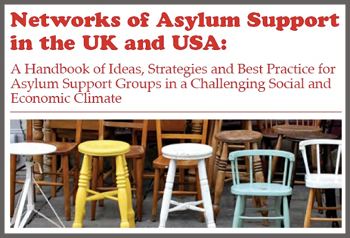 An eighteen month research project focused on the challenges faced by asylum support groups in the United States and the United Kingdom, and different ways of responding to those challenges. The research was been funded by the Economic and Social Research Council of the UK and was carried out by Nick Gill, Deirdre Conlon, Ceri Oeppen and Imogen Tyler. to examine the different dilemmas that different asylum advocacy organisations, including advisory/legal, religious-affiliated, health-focused activist groups and campaign/awareness raising groups face either side of the Atlantic. Please see our website asylum-network where you can read our final report. This project was peer-reviewed and determined ‘oustanding’ in terms of meeting its objectives and its impact.